.................................is the theme over on SPA this week. 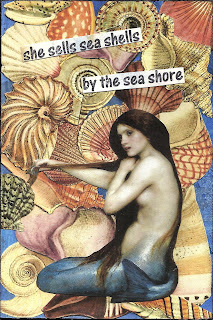 The Mermaid is from Lisas altered art. The shells are from Ceremony. Love, love, love the retro tones on this. A fabulous postcard. The background of seashells with the text says it all! I'll bet she has trouble keeping seashells in stock. I'd definitely buy some. Pretty--love the shells in the background.